Over the weekend we headed to Vegas for a short getaway and decided to do something different. 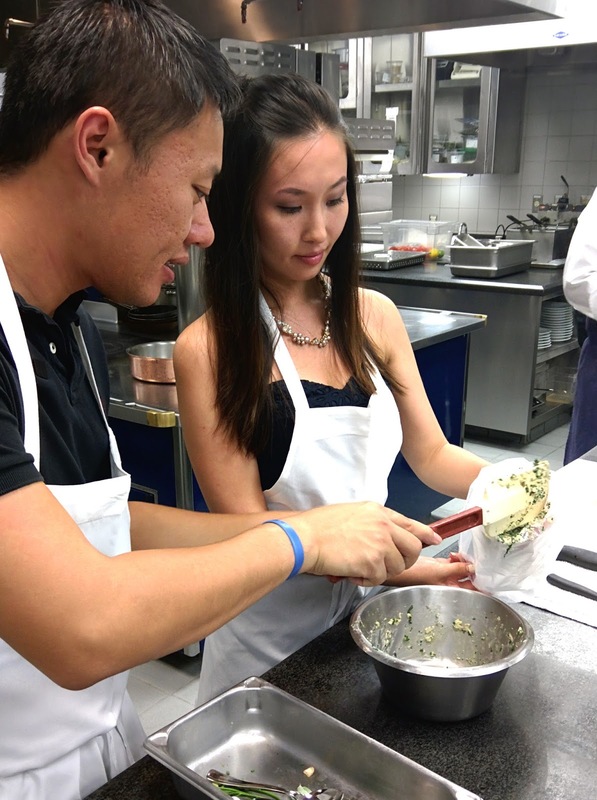 We signed up for a cooking class at Guy Savoy restaurant at Caesar's Palace, cooking alongside world-renowned Executive Chef Chartron. 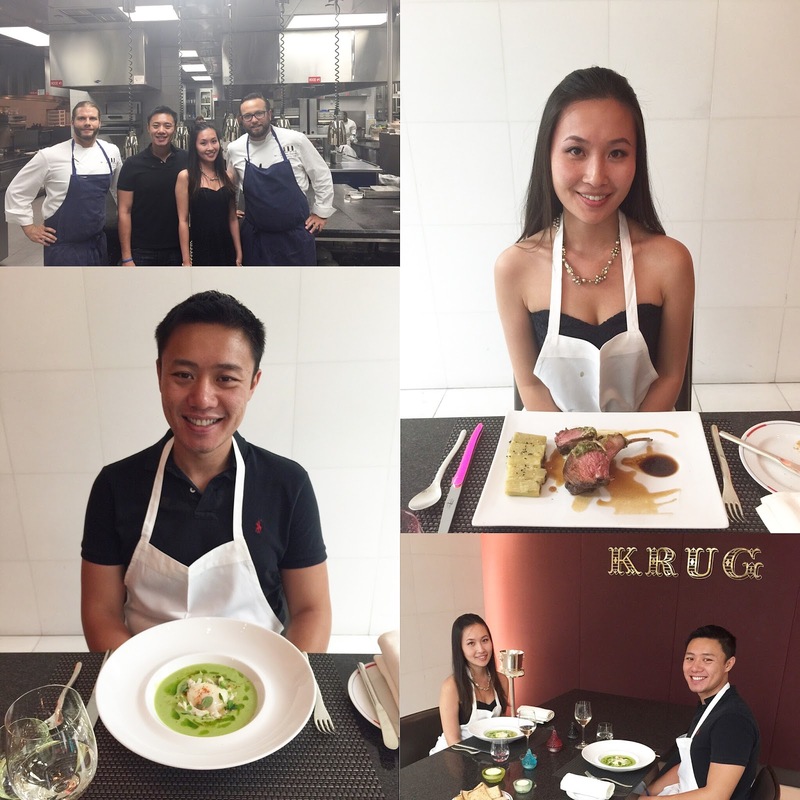 We didn't know what to expect but right when we stepped into the kitchen, it was like we were on a set of Top Chef on Food Network, it was all very surreal! 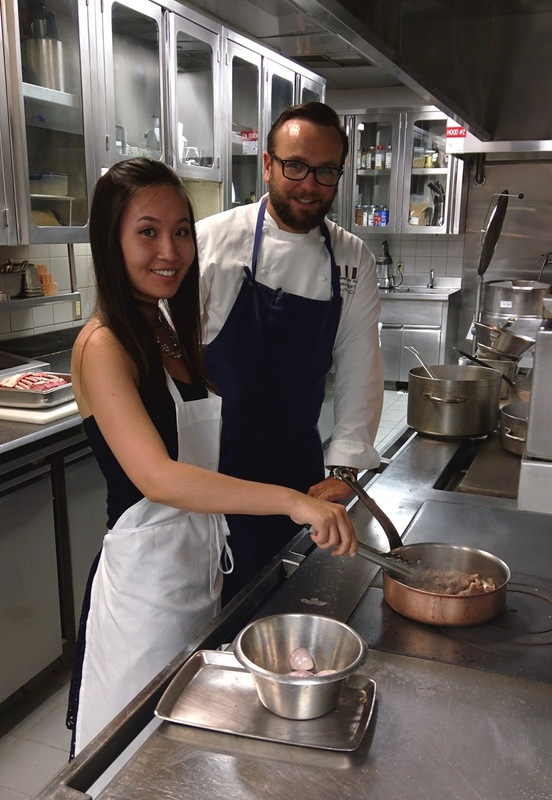 We were set to cook two dishes: Chilled Pea and Crab Soup and Lamb Rack with Rigatoni Gratin. We first blanched the peas for about 10min, depending how hard the peas are, it can go for more or less. Afterwards we shocked them in cold water to stop the cooking process. Once the peas are soft and cooled down, we proceeded in peeling the outer skin of the peas to create a smooth texture and blended it and added lemon, salt and pepper. Keep the peas cold by putting it in a bowl of ice. Follow by blending chives with grape seed oil and strain through a cheesecloth. Chef Chartron told us that just these two simple ingredients can enhance the flavor and bring richness to any dish, especially soups. Poach the eggs in boiling water with vinegar and wrap the egg whites around the egg. Season some crab meat with olive oil, add the lemon segments and marinated peas. It's plating time! Create a ring with the crab meat and peas to create a nest for the poached egg. Carefully place the poached egg inside the ring, followed by pouring the pea soup around. 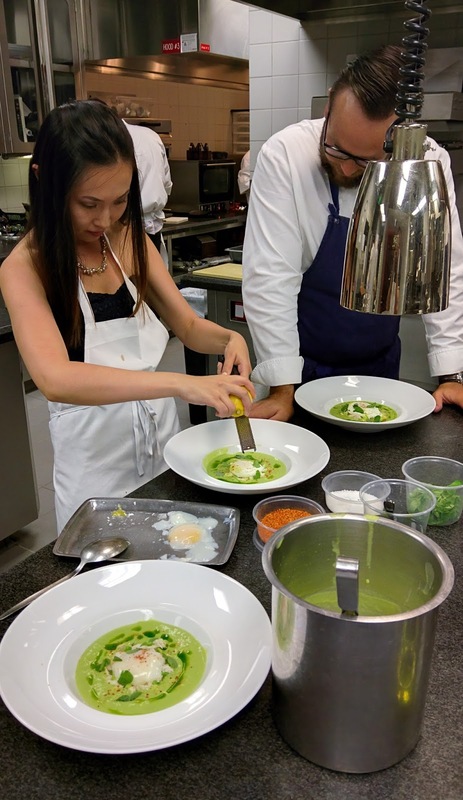 Decorate the soup with Espelette Pepper, chive oil, fresh lemon zest and peppercress. This was pretty challenging to make as I've never made lamb before. I've always thought the crumbly cheesy and melty layer over lamb racks or steak was just a sauce. It turns out it's a lengthy of mixing about 100g of butter room temperature with chopped herbs, bread crumbs, salt and pepper. It's then kneaded flat onto a cookie sheet and refrigerated. Trimming the lamb for the right balance of fat and lean meat definitely required some knife skills! The trimmed fat and tendons are seared with shallots and butter in a copper pan. The key is to wait for the butter to turn golden brown to add all the ingredients. Strain the extra fat and deglaze the pan with veal stock. Reduce the jus until proper consistency (syrupy). Season with salt and pepper and pass through a fine sieve. In creating the Rigatoni, we seared the button mushroom, swisschard, spinach and added cream in searing hot pan. After it gets seared until the mushrooms turn golden brown, we add cream for it to reduce. After cooling it off in the fridge, we chop it thinly. Add the comte cheese and put it in a piping bag to stuff the rigatoni and the graded comte on the top. It's finished off by putting over a broil but a slightly heated stove will do to melt the comte. After searing the lamb, let them rest and place the butter bread crust we made earlier and finish cooking in the oven on broil. 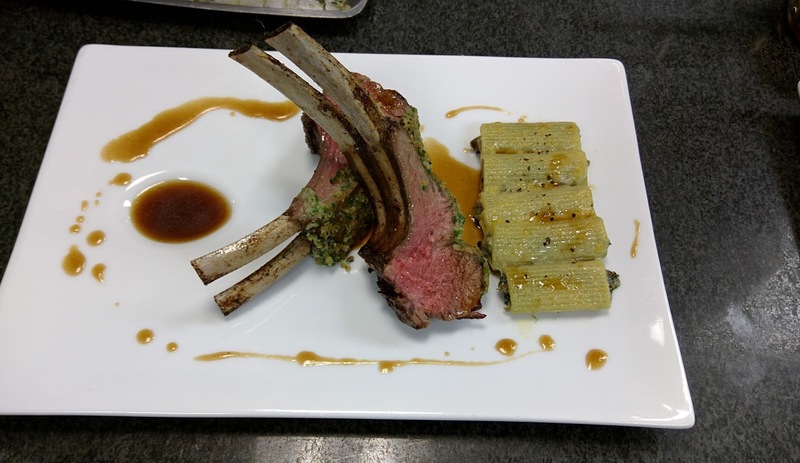 Searing a lamb rack is an advanced cooking technique that's valuable to learn. Apparently pouring the butter over the more meaty parts allows it to cook throughly. 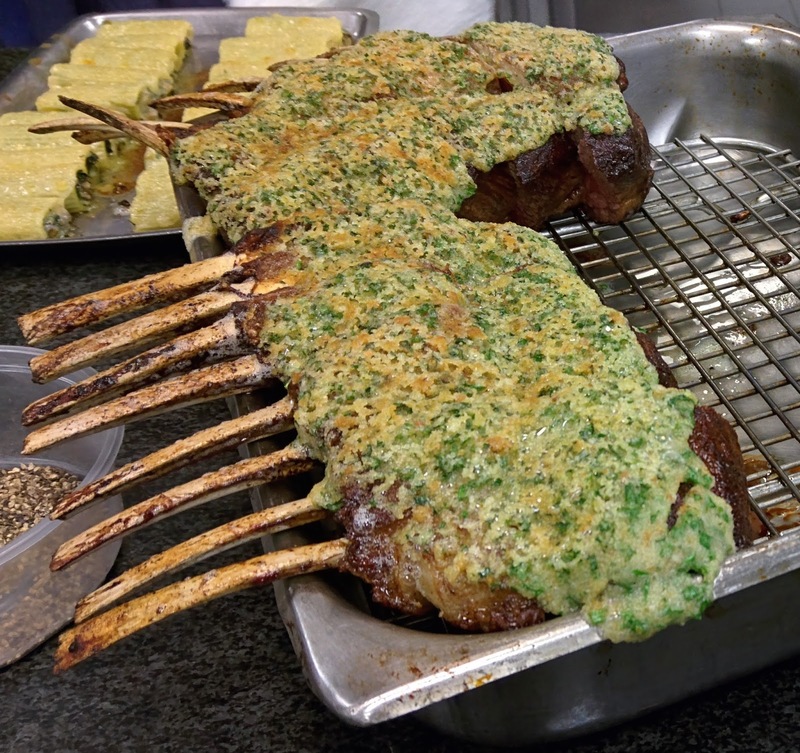 Tilt the pan and use a spoon to pour the simmering butter over the meaty part of lamb rack. The side with less meat would have been cooked already and we don't want to overcook it as the meat will turn tough. Et Voila! Plating success! Just looking at this makes me hungry. 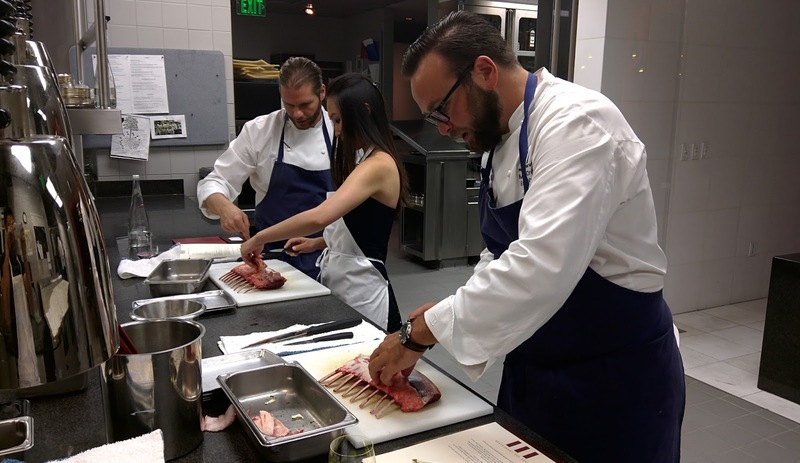 It was an amazing experience cooking alongside Chef Chartron. He was extremely accommodating in helping us take pictures. 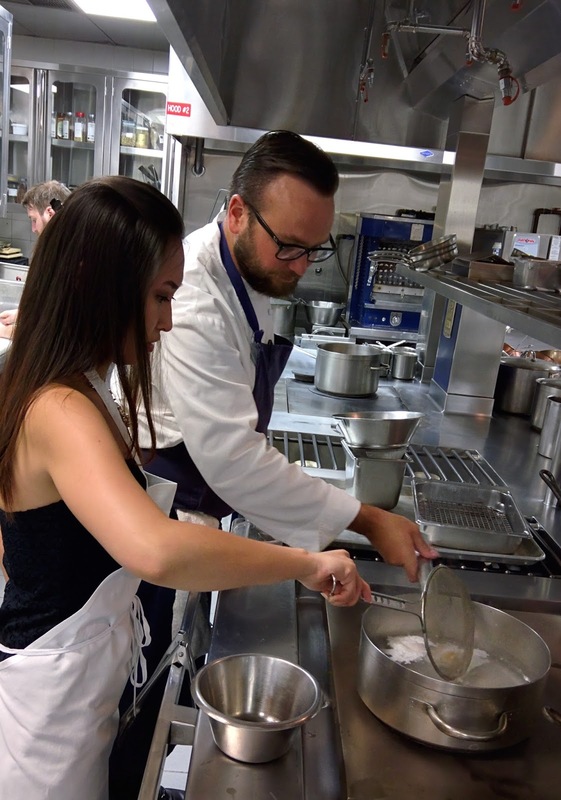 His passionate demeanor makes you perceive fine cooking as an art and he's as excited in teaching you as you are in learning! 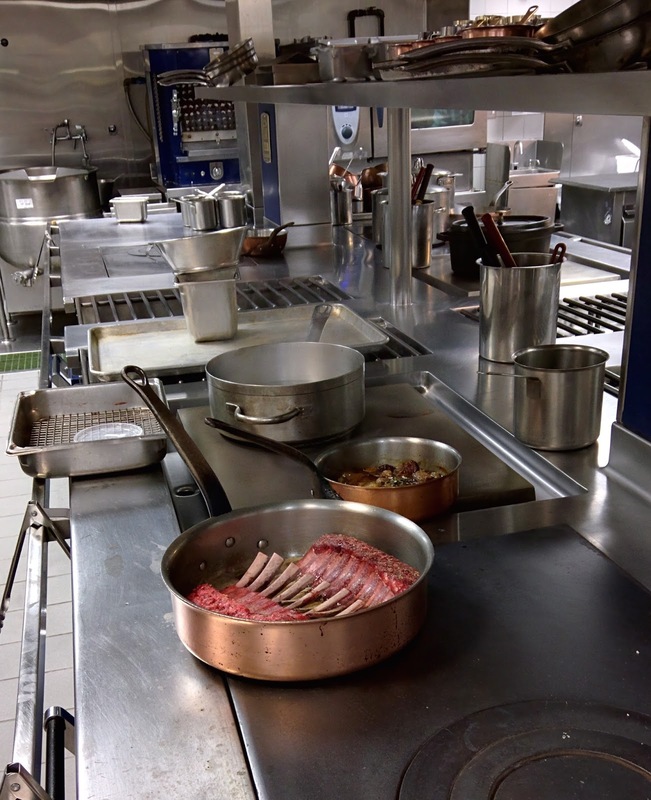 I HIGHLY recommend anyone to embark on this cooking adventure at Guy Savoy Las Vegas! This recipe looks very interesting and yummy! Will definitely going to try it.